This will be a flex start par 2 tournament. The player pack that you recieve will be what you play your rounds with. 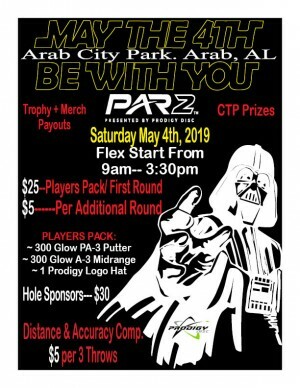 When you round has ended you will be able to play another with a 5 dollar entry. No more cards will be handed out after 3:30pm. Distance and accuracy will be held at 4:45pm using your own personal disc you will get 3 throws per 5 dollars. The goal is to throw as far as you can but keep the disc close to a center line. Further you are away from the center line your distance will be subtracted. The grouping for the will be women's, recreational and advance. Novice will fall into recreational. Monkey Grips Dyes will be setting up with cool custom dyed merchandise as well as making custom dyed disc for the winner of each class. Sand Mountain Disc Golf Club is responsible for all refunds/cancelations. - 3:30pm Flex start rounds.